Home 5-6 DTI Duterte Executive News P3 President Pondo sa Pagbabago at Pag-asenso (P3) program to replace “5-6” money lending system. 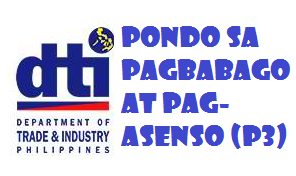 Pondo sa Pagbabago at Pag-asenso (P3) program to replace “5-6” money lending system. What is the main goal of Pondo sa Pagbabago at Pag-asenso (P3) program? to replace the “5-6” money lending system or the so-calle "Bombay" which has 20% interest rate. to bring down the interest rate at which micro-finance is made available to micro enterprises. P19 billion financing initiative for micro and small businesses in the next five years. Program Management Office (PMO) - oversee the management and monitoring of fund. Loanable amount per end-borrower can range from P5,000.00 for start-ups to P300,000.00, with maximum interest rate of 26% per annum with no collateral requirement. This rate is significantly below the 20% per day/ week/ month charged by “5-6” lenders. It is also lower than what is charged by most MFIs. MFIs may opt for portfolio guarantee cover of up to 15% of their P3 loan portfolio from SB Corp at a guarantee fee of 0.4%. The guarantee feature is seen to help MFIs address the P3 Program’s inherent risk. The guarantee fund will be sourced from the P3 fund.